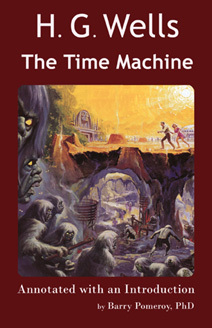 This annotated edition of H. G. Wells' first and justly most famous novel, The Time Machine, is meant to encourage the pursuits of scholars who are either encountering Wells' influential classic for the first time or are returning to it in order to delve more deeply into its antecedents and influences. In a story that continues to have resonance for the modern reader, Wells imagined his future world deeply divided along class lines which had split the human species into two: the Morlocks, malign, underground proletariats, and the Eloi, futile, beautiful aristocrats. His Time Traveller slips from one age to another in what proves to be both a parable about British society and debate about human nature and the fragile flower that is "gratitude and a mutual tenderness." In the introduction to the text, I also present a reading of the novel through the lens of Marx, Darwin, and Freud, and outline its major themes and concerns, including the importance of Weena, which former scholarship has overlooked or ignored. In order to trace the antecedents of the text, I include here an introduction to Herbert George Wells and his work, as well as an annotated version of the rather derivative Chronic Argonauts and the strikingly original novel it became.